My parenting journey began in New York City when I was living in a predominately Haitian neighborhood in Brooklyn. Every day I traveled to work on the 2/3 trains, my belly increasing in size and the rising summer temperatures of New York becoming unbearable (especially on the trains that did not have air conditioning). When I would get on the train in the evening in Union Square, the Haitian women would already be well adjusted in their seats, traveling from the Upper East Side, likewise tired from taking care of upper class Caucasian children and their high-maintenance parents. The Haitian women would see my extremely large belly, smile, and typically pat it as I walked by them searching for a seat to no avail. Never was I offered a seat—pats on the belly and gender predictions, but never a seat. Once my son was born, I was exhausted from the daily fight of living in NYC. I loved this city—I loved the fast pace, the diversity, and the arts—but I was exhausted from having to fight for every square inch of personal space. I was tired of carrying my overpriced Maclaren stroller up four flights of steps to our apartment, tired of being crammed next to strangers in trains with a baby strapped to my chest. I was ready to go. I needed more space! Ironically I now reside in a small GHI (Greenbelt Homes Inc.) townhouse with my wife and two sons. I actually prefer small spaces, because I believe they keep us from acquiring more than we need. I adore living simply: everything in our space is used, and we value the items we have acquired. This past week, we went on vacation to Myrtle Beach, SC. 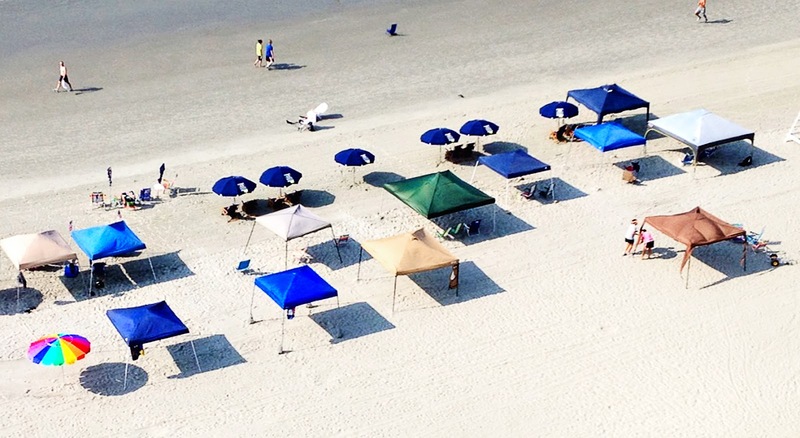 It was the first time there for our family, and I was taken aback by the aggressive beach tent culture. Each morning around 6 a.m., other vacationers would be on the beach claiming their ideal oceanfront space with giant 10' x 10' foot tents. What happened to beach umbrellas?